Start the conversation now. Call your dedicated VG rep at (800) 844‑1197 Mon-Fri 8am-5pm CST. Follow-up the phone call with a refined question/note when you submit the form at the very bottom of this page! Do. Not. Hesitate. Reserve ad space pronto and submit artwork before VG’s devoted staff meets crunch time: April 15, 2019. The July 2019 issue is currently in progress; note our advertising opportunities and article features. Pay attention to where BONUS distribution is headed. Budget and plan for the future using the yearly schedule. FAQ, ad sizes, readers’ stats, VG for Retailers and much more is below. Bookmark this page and visit monthly to pinpoint how VG can accelerate your business. Is your company working with any of the following artists or gear makers? Submit an ad to really stand out! Bolded features shown on cover. All features subject to change. 1) Advertorial and a Facebook post. 2) Advertorial, Facebook post, and full-color quarter-page ad. 3) Advertorial, Facebook post, and full-color half-page ad. Classified listings are FREE for VG subscribers and advertisers. Submit your recording for Hit List. Register a guitar show in Upcoming Events. If you have a store tour, factory tour, product demo or just a video of your favorite artist on YouTube, you can send us the link and we’ll post it on one of our VGTV channels for VG fans to see. KEEPING THE BLUES ALIVE AT SEA MEDITERRANEAN • We invite you to join the inaugural sailing of Keeping the Blues Alive at Sea Mediterranean leaving from Barcelona, Spain and sailing to Monte Carlo, Monaco and Valletta, Malta on Norwegian Pearl, August 16-21, 2019. Sail aboard our floating music festival with Joe Bonamassa, Peter Frampton, Kenny Wayne Shepherd and more for an immersive Blues experience that connects music lovers of all ages in an environment unlike any you’ve ever experienced. VG contributor, Johnny Zapp with guitar legend, Jimmie Vaughan at NAMM Show. VG is the only guitar magazine distributed at 76+ guitar shows and events throughout the year! Request copies of Vintage Guitar magazine to be at your event by contacting Joan Trygg → JoanT@VintageGuitar.com. Better yet – get your event published for FREE in VG when you submit your guitar event to “Upcoming Events”. See full calendar and past show photos at www.VintageGuitar.com/Upcoming. Among the hustle and bustle of guitar events attendees freely grab issue(s) of VG as they enter. Your ad in VG will reach pre‑qualified customers — folks who’ve paid $20 or more of their hard‑earned money to see a room full of guitars and guitar related products. Even if you can’t be at the show or event, your product or service can be in front of eyes that matter. The 2019 VG calendar is ready to dominate a wall in your office and keep your important dates in sight. Budget and plan for the future using this yearly schedule! Note our advertising opportunities and article features. Pay attention to where BONUS distribution is headed. Reserve ad space pronto! 08/23/2019 Ad space must be reserved. 08/30/2019 Ad files must be submitted to your VG rep. Updated 03/28/19. Magazines arrive in mailboxes approximately the 15th of each month. Don’t wait another day! For pricing info and more, simply submit the form below! 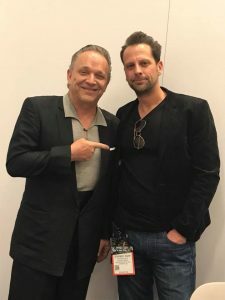 How do I add my guitar show to the magazine and website? Simply submit your info to this form or e-mail JoanT@VintageGuitar.com. All submissions must be received by the 10th of each month, or they will appear in the next available issue. This listing is done as a service to our readers and we reserve final determination as to its contents. How do I submit my album for review? Submit an album for potential review by simply filling out this form and our review staff will be in contact with you. How do I offer my product for review? Submit a product for potential review by simply filling out this form and Dennis Pernu will be in contact with you about your product. I have some new and cool gear. How can VG promote it? Gearin’ Up is the perfect place to put your gear in front of eyes that matter. Simply fill out this form – the VG staff will soon contact you. How do I place a classified ad? DEADLINE for submission is the 10th of each month. VG Classifieds are FREE for VG subscribers. Start a subscription for just $24.95 and submit your FREE listing! Non-subscribers must pay $50.00/listing. Submit a Classified at https://store.vintageguitar.com/classifieds-submission.html or contact Joan at JoanT@VintageGuitar.com or 1-800-844-1197. I would like to carry VG products in my store. Music magazines, like VG, are a proven traffic generator for music stores, but the distribution system is outdated. The Vintage Guitar team designed the 5‑Pack and Box of 6 to greatly simplify the system for retailers! For more info call Joan at (800) 844‑1197. Visit www.vintageguitar.com/frequently-asked-questions to see full list. Width × Height • Page size: 9" × 10.875"
Take action today! For pricing info and more, simply submit the form below! Logo Design, Ad Design, Special Requirements $50/hr. Photo Effects (silhouettes, drop outs) $20/ea. • Line Screens- 110 for black and white, 133 for inside full-color glossy pages, and 150 for cover glossy pages. • Four columns to a page. • One column width 2.5"
• Two column width 5.1875"
.jpg 300 ppi at actual size of ad. .tif 300 ppi at actual size of ad with or without zip compression. .pdf Please embed all fonts (or subset 100%). Resolutions on color/grayscale images should 300 ppi at actual size and monochrome images 1200 ppi at actual size. Use Zip compression when available for color/grayscale images and CCITT group 4 compression for monochrome. No cropmarks or registration. The PDF should be the same size as mechanical requirements above. Frequency discounts will be applied after advertising agreement is signed and returned to Vintage Guitar. Cancellations or changes in orders must be in writing and will not be accepted after the 15th of each month. Display ads are not commissionable. By placing an ad with Vintage Guitar magazine, the advertiser or its agency, if any, jointly and severally agree to indemnify and hold harmless Vintage Guitar Inc. against any liability including expense resulting from claims or suits based upon the content or subject matter of the advertisement, including but not limited to claims or suits for libel, violation of rights of privacy, plagiarism, copyright or trademark infringement, or unauthorized use of name, likeness, statement or work of any person. 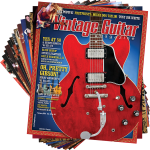 Vintage Guitar is the largest magazine dedicated to those who love the great guitars of today and yesterday. 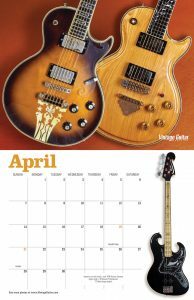 Each monthly issue contains features on collectible instruments, great collections, interviews with players, technical articles, brand and model histories, new product reviews, and much more. 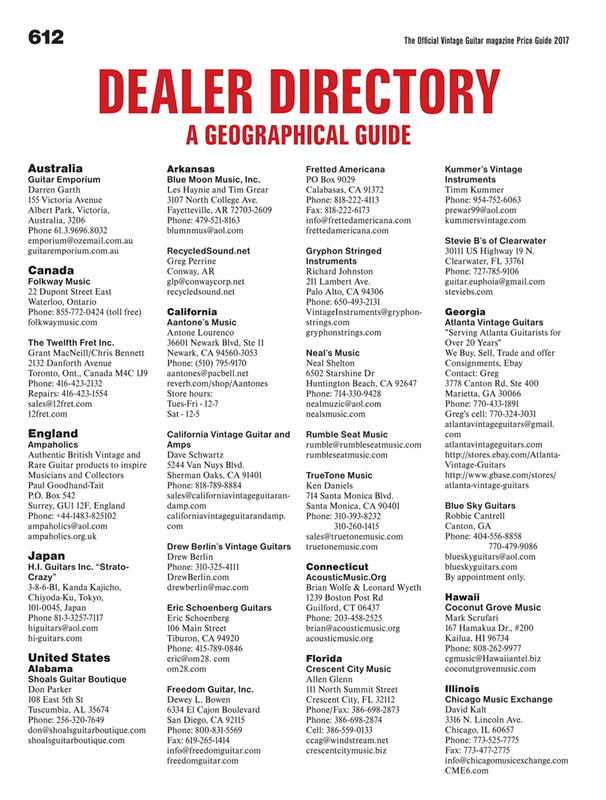 Each issue also has over 300 ads from manufacturers and dealers from all across the U.S. and from overseas. That means Vintage Guitar advertising works! And it’s very affordable. With distribution to subscribers, musical instrument stores, large book chains, guitar shows, newsstands, and special events, each issue is read by over 65,000 guitar fans – every one is a potential customer! 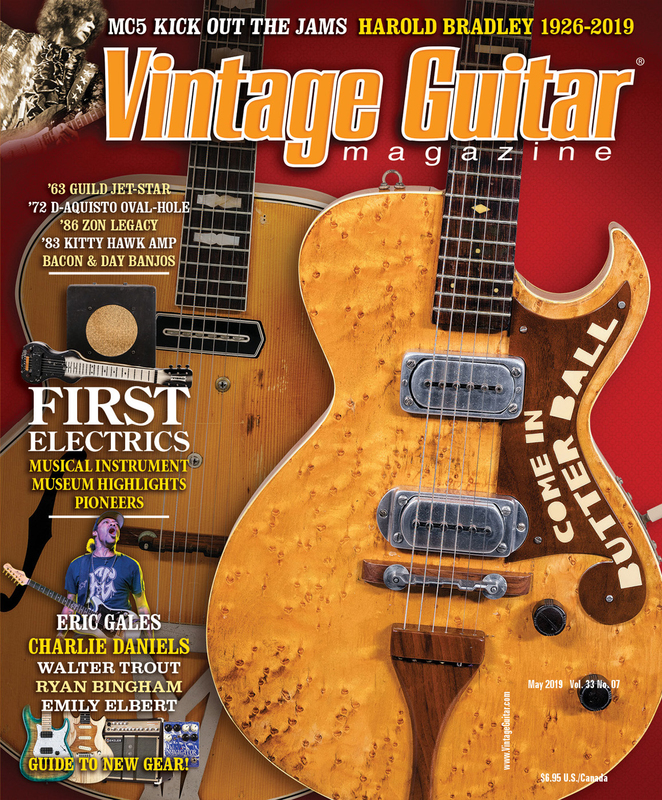 Vintage Guitar is not just a great magazine but a popular online destination too. Every day more than a thousand individuals stop by the VG website to browse the articles, check on the latest news from the VG newswire, and post their photos resulting in more than 110,000 page views per month. VG also hosts a popular (487,000+ likes) Facebook page. → 47.6% of Vintage Guitar readers report a household income of more than $100,000 per year! → 77% refer to the magazine when making buying decisions. → 83% plan to buy one or more guitars this year. → More than 54% plan to buy one or more amps in the next year. → VG readers will spend more than $63 million on new gear this year! The Vintage Guitar team designed the hassle‑free 5‑Pack and Box of 6 with retailers in mind! As you are made aware each day, the world of music retailing is constantly changing. Use VG’s 32 years of being in business to help navigate these changes – introducing the brand new, hassle‑free 5‑Pack and Box of 6! Music magazines, like VG, are a proven traffic generator for music stores, but the distribution system is outdated. The Vintage Guitar team designed the 5‑Pack and Box of 6 to greatly simplify the system for retailers! Sell more gear in 2020 when you advertise in The Official Vintage Guitar Price Guide – YOUR #1 VALUATION RESOURCE! The Guide gathers input from 35 of the world’s foremost expert dealers, each of whom brings decades of experience in the business. That’s one of many reasons it’s the most-trusted source for values! 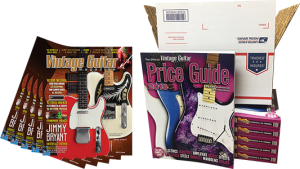 Thousands of guitar enthusiasts buy The Official Vintage Guitar Price Guide and use it continuously throughout the year. Thousands more refer to it at guitar shows, guitar shops, and of course at the local bookstore. Their hearts are racing in anticipation of finding the guitar of their dreams listed among the thousands of entries. If only you could be there every time, to assist these people in owning that instrument. You can! Get ’em while they’re in the mood, put your ad right in the face of the buyer. When they look up their favorite instrument, your ad is in their hands. Who are they going to call? Advertising in the Price Guide is an easy and profitable way to sell more gear. The fact that space is very limited (less competition), gives you even more exposure. Call your friendly VG rep now at (800) 844‑1197 while there’s still space available. Materials Deadline: August 30, 2019. No crop marks or registration. The PDF should be the same size as mechanical requirements above. Peek at the directory from The Official Vintage Guitar Price Guide 2017. Publish all the contact info a guitar enthusiast would need to find your business. Looking for an affordable way to get your name in front of guitar enthusiasts across the world with the most trusted source for vintage fretted instruments and gear pricing? 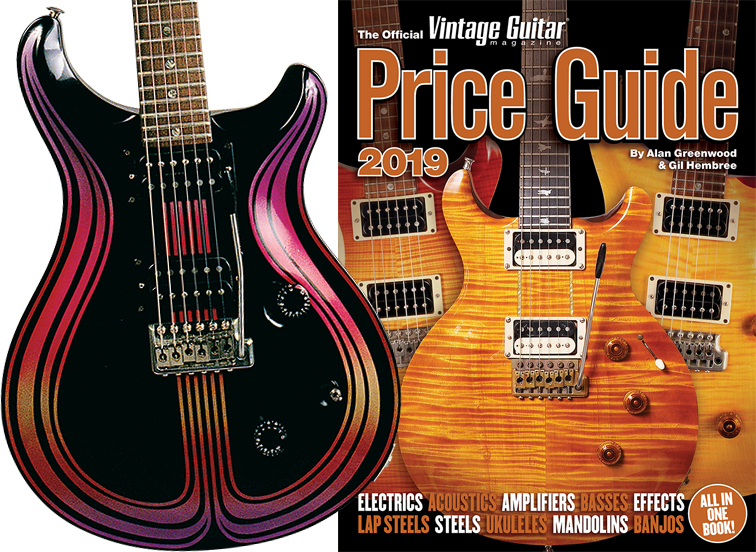 A simple investment of $60 gets you a directory listing in the upcoming Official Vintage Guitar Price Guide 2020 with all the contact information a guitar enthusiast would need to find your business. Your listing will be featured in both the print and digital copies with a debut at the Amigo International Guitar Show in October 2019! › › REMINDER: all survey participants and advertisers in The Guide receive a complimentary directory listing. Leap from only a $60 directory listing to a full-color advertisement, thus you’ll receive that directory listing for FREE. Upgrade your advertisement – full, 1⁄2, 1⁄4, and 1⁄6 page sizes are available. Email Joan, JoanT@VintageGuitar.com, your directory information or call (800) 844‑1197. 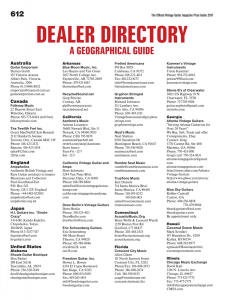 Dealer Directory Company name, address, phone, fax, email and website address FREE with ad purchase or $60 alone. Manufacturer Directory Company name, address, phone, fax, email and website address FREE with ad purchase or $60 alone. Tech/Repair Directory Company name, address, phone, fax, email and website address FREE with ad purchase or $60 alone. Listings are placed in a special section of The Guide and are categorized by state. Advertising Banners: Choose the leaderboard banner (728 pixels wide by 90 pixels tall) or the side skyscraper banner (160 pixels wide by 300 pixels tall) and let the Vintage Guitar website drive customers directly to your site. The banners run randomly on all the VG web pages so you’ll be seen no matter where they’re browsing. Promoting a special event or sale? Your ad alone will run in every banner position on our website for a full day (or days). Email Inbox Marketing: Tap into VG’s coveted e-mail list. You can reach 25,000+ opt-in guitar fans by e-mail. Sponsor a VG email which includes two banner positions. Sponsored Facebook Post: Get your shop or product on VG Facebook page (487,000+ likes) includes a free boost ($20/each additional boost). Upcoming Events: Get your event published for FREE in VG when you submit your guitar event to “Upcoming Events”. See full calendar and past show photos at www.VintageGuitar.com/Upcoming. Call (800) 844-1197 to talk to a VG representative! Mon-Fri 8am-5pm CST. If you are interested in advertising in Vintage Guitar or having trouble emailing your VG rep simply submit this form. The VG team will receive a direct notification that won't get caught up in email servers. Don’t know your rep’s name? Select James, the Advertising Director, he will get you on the right track! Allowed file extensions: jpg, gif, png, pdf. Max file size: 2MB.